Any Suggestions For Ways I Can Attract More Haters? Ann Friedman, who’s spent more time thinking about this than I have, came out with a handy Disapproval Matrix today. I can’t say if she’s found the perfect framework for hater understanding, but this looks like an important contribution to a burgeoning field of study. Haters: This is your garden-variety, often anonymous troll who wants to tear down everything about you for no rational reason. 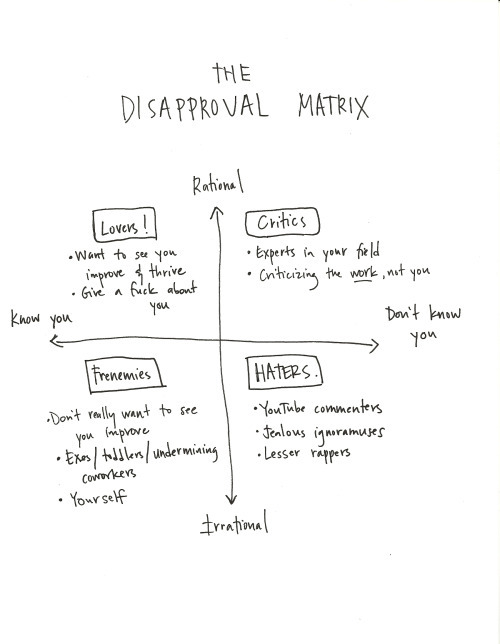 Folks in this quadrant are easy to write off because they’re counterproductive and you don’t even know them. Ignore! Engaging won’t make you any better at what you do. And then rest easy, because having haters is proof your work is finding a wide audience and is sparking conversation. Own it. I must say the penultimate sentence of this paragraph left me feeling insecure. I haven’t yet acquired any (public) haters. What am I doing wrong? My lack of haters is a clear indication that my career isn’t advancing as it should. Anne Hathaway–who seems utterly inoffensive to me–gathers haters with ease. What’s her secret? Is it just having the right publicist? There’s a TED talk in it, at least, for anyone who unlocks the mystery. In the meantime, any suggestions on how I can be more unjustifiably loathed?